Ty Buchanan is living on the peaceful grounds of St. Monica's, far away from the glamorous life he led as a rising trial lawyer for a big L.A. firm. Recovering from the death of his fiancée and a false accusation of murder, Buchanan has found his previous ambitions unrewarding. Now he prefers offering legal services to the poor and the under-represented, from his "office" at local coffee bar The Freudian Sip. A mysterious woman with a six year old daughter comes to him for help. She's being illegally evicted from a downtown transient hotel, an interest represented by his old law firm and former best friend, Al Bradshaw. Buchanan won't back down. He's going to fight for the woman's rights. But then she ends up dead, and the case moves from the courtroom to the streets. Determined to find the killer and protect the little girl, who has no last name and no other family, Buchanan finds he must depend on skills he never needed in the employ of a civil law firm. James Scott Bell's fiction has been compared by Booklist and the Los Angeles Times to Raymond Chandler and Dashiell Hammett, two of his favorite authors. A former trial lawyer, Jim was also fiction columnist for Writers Digest Magazine and adjunct professor of writing at Pepperdine University. His book on writing, Write Great Fiction: Plot & Structure, is one of the most popular writing books available today. After graduating from Taft High School in Los Angeles, Bell went on to play basketball at the University of California, Santa Barbara where he pursued a degree in Film. But his love of writing shot to the forefront of his interests. While still in college, Bell's writing got him a spot to study with Raymond Carver, one of America's most honored writers. Bell also won an award for a screenplay he wrote in his senior year. After graduation, Bell moved to New York to write for the theater. Almost immediately he was cast in a small role in an Off Broadway production of Othello, "and I began my actor phase." That phase included stints in several Off Broadway productions and in television commercials. "Commercials were nice," Bell remembers. "I'd hold up a tray of hamburgers for McDonald's and keep getting these residual checks. What a business." While in New York Bell met his wife to be, an actress, and decided one thespian in the family was enough. He went to the University of Southern California Law School, graduated with honors and won the American Board of Trial Advocates' Award as the top student in Trial Practice. He was a litigator for a year with a large L.A. firm before opening up his own office. He now writes full time. His favorite writers, in addition to Chandler and Hammett, include John D. MacDonald and Michael Connelly. In TRY DARKNESS, James Scott Bell gives readers a breathtakingly suspenseful crime novel. His writing style is clever and engaging and keeps the reader turning pages to see what will happen next. The book was really fun to read (I often like to not have to work quite so hard all the time when I read). As a fan of books with short chapters, like the kind James Patterson writes, I really enjoyed reading my first James Scott Bell book. Bell writes short chapters so you can read “just one more”, however, just so you know, he has some REALLY short chapters so be prepared for that. 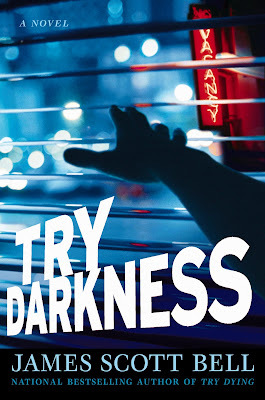 Ty Buchanan is back in this latest James Scott Bell thriller, TRY DARKNESS. Ty is a rare, casual and unconventional man who we wouldn’t normally associate with being a lawyer, but indeed he is. However, after being charged for a crime he didn't commit, the big powerful law firm he worked for fired him. Of course, once he proved his innocence, the firm wanted him back but Ty made a major life change. He gave up his fancy home and moved to live in a trailer just outside a monastery. There he found an unlikely partner in Sister Mary Veritas, who also likes a good game of basketball. Through the monastery, Ty gets many of his clients as he now is working with the poor and doing mostly pro bono work. Ty's latest case involves a young girl, Kylie, whose mother was viciously murdered right in front of her. The woman, Reatta, had previously come to Ty for help as she was going to be evicted. Ty’s powerhouse old law firm and best friend were representing the beat up old hotel that was trying to illegally kick her out. Ty and Sister Mary Veritas look into the case, and they discover a conspiracy between, you guessed it, Ty's old law firm, and a formidable business tycoon With many new, well-developed characters, Ty has to try and solve this case for little Kylie who has stolen his heart and is left with no last name, all alone in the world. In place of much courthouse action, Ty takes the case on and finds a whole different world of legal matters to deal with then ever before. His connection with Sister Mary Veritas becomes more interesting as the story concludes in a cleverly satisfying finale, and with Kylie’s help, the reader can see how many of these characters will no doubt be following Ty into Bell’s next adventure in this series. +1 MORE ENTRY: TWEET ABOUT THIS GIVEAWAY AND COME BACK AND LEAVE A LINK...YOU MAY DO THIS ONE TIME EACH DAY BUT MUST COMMENT EACH TIME YOU DO ONE. I WILL CHECK AND EACH TWEET OR RETWEET WILL COUNT AS AN ENTRY. +1 MORE ENTRY: SHARE ABOUT THIS GIVEAWAY ON FACEBOOK AND COME BACK AND LEAVE A LINK SO I CAN FOLLOW TO FIND IT. PLEASE DO THIS ONLY ONCE! I like that our dear hostess reports in her review that this book was really fun to read! The author likes LA because "it always feels like something can happen" in that city, "and often does." This sounds like a quick reading, suspenseful book. I think the pro bono, street lawyer aspect of this book would be interesting. I found it interesting that the author returned to writing after seeing the movie Moonstruck...after previous careers of acting and law. He went to Taft High School, a rival school of mine in L.A. He also is a former trial lawyer. He has written a lot of books in one of my favorite genres. I will have to check him out at the book store. I've read that this was a fun read while being a page turner. Just what I need right now. I've read that this was a fun read and a page turner. Just what I need right now. WooHoo! his dad played basketball w/ Jackie Robinson! I like the fact that the author chose to tell the story using a humourous voice; the the narrator's voice is reminiscent of Lawrence Sander's Archie. I was very pleased to learn that the author writes inspirational fiction, I plan to read his inspirational series. I found it interesting that he had a role in an Off Broadway production of Othello! On his website I discovered that he also writes a couple of books for writes, " Write Great Fiction". One is Plot and Structure, and another was in regards to editing and revising. I also realized that the book I just started earlier tonight (Sins of the Fathers) is considered inspirational fiction! I was not aware of that! It was odd to me that he chose to give every luxury up and move into an old trailer...hmm! I like that you report that the book is easy to reasd (and fun) and it has shorter chapters. I am looking forward to this book whether I win or not. Thanks for the chance. I liked going through the photo galleries on the author's web-site. I like that you said the book is fun to read. Sometimes we just need a break! I liked all the facts you told about him in your review. He went to the University of Southern California Law School and was the top student in trial practice. One of his favorite quotes is "A great story is life with the dull parts taken out" by Alfred Hitchcock. I think this sounds great, I love the back story that leads the character to where he starts for us. I like that the author was a basketball player in school. I like that this book is easy to read, and well=written. I like that is a quick read and it sounds like my type of book. I find it interesting that after he is cleared of the crime that he did not commit, Ty starts to represent the people who have no one to speak for them. I will love watching him take on his old law firm in the upcoming battle. I found it interesting that he is an adjunct professor of writing at Pepperdine University. I did go and post about this giveaway on my facebook page. It can be located under Christine Womack at http://facebook.com. sound great! I love short chapters - it make the books read faster. I thought the whole review was interesting and I was happy to read that you liked the book. The legal aspects of the book sound interesting as I love this kind of book, and the part about the little girl, Kylie, pulled my heartstrings, so I am hooked. I too love short chapters! I also like James Patterson's short chapter writing style & am pleased to see that this book is written in a similar fashion. Mr. Scott played basketball at the University of California, Santa Barbara. I learned that Mr. Scott once had a small part in an off Broadway production of Othello. I like that you said this book was fun to read. Sometimes I get tired of always having reread passages to figure out what the heck is going on. I entered the Lunch in Paris Giveaway. I learned that he also writes inspiration fiction.